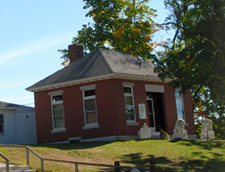 This Exciting site will provide you with information on the Hooksett Historical Society and about interesting facts about the History of Hooksett . the HHS is now 43 years old and our town is 195 years strong. Look at the various pages for town and society events, photo’s and archival items. Each page will give you a unique look into our history, its buildings, its people and its life. Enjoy! Join the Hooksett Historical Society and become part of Hooksett History. Contact the society if you are willing to help at openhouses, inventory or organizing our collection. Theres many things that can be done. The header photo is taken from a circa early 1900’s postcard which depicts the railroad trestle with the old wooden passenger bridge ( in background) on the Merrimack River in Hooksett Village. On Thursday, October 25, at 6:30 p.m. at the Hooksett Library, the Historical Society will feature The Photography of Ernie Gould–Pictures from Hooksett’s Past. Mr. Gould was a local photographer and civic-minded resident, recognized as 1985’s Citizen of the Year. He was his ship’s photographer in WW II and later worked as the official photographer for the NH Fish and Game Department, the Manchester Historic Association, and Hooksett’s Historical Society. He also did photographic work for several of the largest architectural and engineering firms in the area. A meeting of the Historical Society will precede the program. On May 20th, the Society held its meeting at the Hooksett Public Library. In a brief report, HHS President updated attendees on Activities that occurred at Heritage Day and HHS program on the 19Oth birthday of Governor Head at Head Cemetery.